April 15 may have come and gone, but if you are the plan administrator for a Solo 401k or any other ERISA retirement benefit plan, there is another IRS deadline that you need to pay attention to. Neglecting to file a Form 5500 or filing one late can result in costly penalties. The major benefit of opening a Solo 401k is the ability to contribute more than all the other tax-deductible retirement accounts available to a self-employed individual. The one “downside” you may have seen mentioned when opening a Solo 401k is the “additional paperwork” that is involved if you are acting as your own plan administrator. This additional paperwork is the yearly filing of the Form 5500 once your Solo 401k account reaches a certain size. In this post, I am going to go over everything you need to know about the Form 5500, provide instructions on how to fill out a Form 5500-EZ for a Solo 401k, along with showing an example completed Form 5500-EZ. You can find more about the Form 5500 and download instructions on how to complete a Form 5500 by going to the IRS Form 5500 Page. The due date to file your Form 5500 is the last day of the seventh month after the plan year ends. For those with a calendar year plan, the deadline is July 31. Form 5500, Form 5500-SF, or Form 5500-EZ? There are three types of Form 5500. The Form 5500-EZ is for one-participant plans only; Form 5500-SF is for one-participant plans and plans with fewer than 100 participants; Form 5500 is for plans with 100 or more participants. One-participant retirement plans covers a business owner with no other employees. This includes the owner and their spouse, or one or more partners and their spouses in a business partnership. If you have a Solo 401k, you are eligible to file a 5500-EZ. However, you may not need to file a 5500-EZ at all if the total plan assets at the end of calendar year did not exceed $250,000 unless it is the final plan year of the plan. You can refer to the IRS Instructions on Form 5500-EZ for more details. As a Solo 401k plan administrator, I prefer to complete and mail the two-page 5500-EZ because it is one less account to register and remember the login for. For information on whether you need to file a Form 5500, or how to complete the Form 5500-SF, you can download the Instructions for the Form 5500 or Instructions for Form 5500-SF. The penalty for not filing a Form 5500-EZ on time for a plan year can be $25 per day, up to a maximum of $15,000 plus interest. This is for each late form. Not filing the required forms for 10 years could mean you can owe up to $150,000 in penalties. If you forgot to file a Form 5500, the IRS / Department of Labor offers a penalty relief program if you correct the delinquency before they notify you. For Form 5500-EZ filers, you will have to file the delinquent returns and pay a fee of $500 per return, up to $1,500 per plan. For plans with less than 100 participants, the penalty is $10 per day past the due date, not to exceed $750 per annual return, up to $1,500 maximum per plan. The maximum penalty for plans over 100 participants is $2,000 per annual return, up to $4,000 per plan. You can get a 2.5 month extension by filing a Form 5558 with the IRS before the due date of your Form 5500. It may vary for other trustees, but with Fidelity, every May they mail out an Annual Valuation Statement to help you complete your Form 5500. This statement includes the value of your Self Employed 401k account on January 1 and December 31. It also includes any cash contributions made during the year along with any distributions taken. 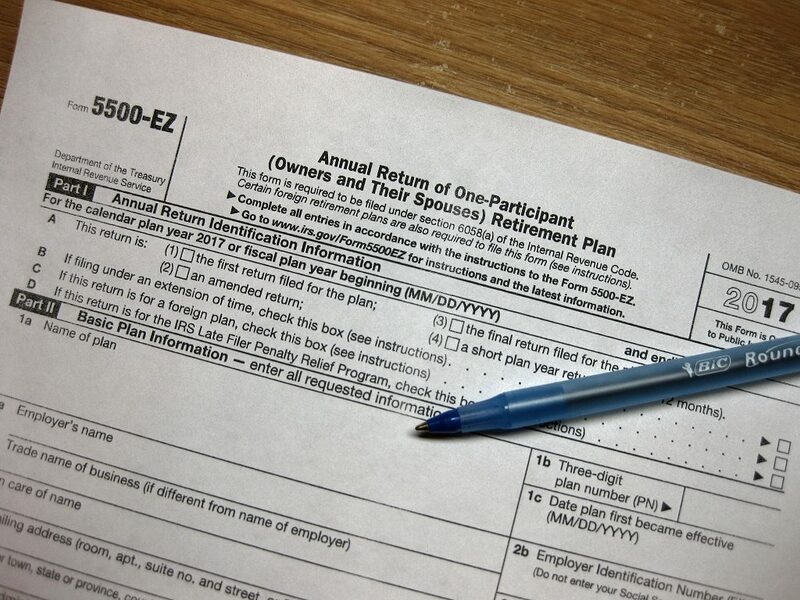 If you haven’t already, download the Form 5500-EZ and the 5500-EZ Instructions from the IRS website. See the instructions to determine if you need to check any of the boxes in this section. 1a. Name of Plan – Enter the formal name of the plan. 1b. Three-digit plan number – Plan numbers are consecutive, starting with 001. Once this number is chosen, you will use this same number for all future filings for the plan listed in 1a. 1c. Date plan first became effective – This will be the first day of the plan year or the date that the business was established. 3a-c. Plan administrator’s name, address, EIN, and telephone – Enter “same” in 3a if it is the same as the employer’s info and leave the rest blank. 6a. Total plan assets – You can find this info on your Annual Valuation Statement from your trustee if you received one. Otherwise, look on your account statements. 7a. Employer contribution – Enter the amount of the employer profit sharing contribution. For a Solo 401k, this up to 25% of compensation. 8. Plan Characteristics – You can find the plan characteristic codes in the instructions. The below codes are for a profit sharing Solo 401k plan with Fidelity. The below completed 5500-EZ is for a Solo 401k profit sharing plan at Fidelity for an internet publishing business such as a blog or website. It is easy to forget to file a Form 5500-EZ, especially when the deadline is in the middle of summer when we are long done with taxes and thinking about vacations at the beach instead. My recommendation is to put a reminder on your phone’s calendar or whatever you use to keep track of dates. The 5500-EZ is a quick two-page form that only takes 10 minutes a year to fill out. After you’ve filled out your first return, keep a copy and refer to it in future years. With a one-participant plan, when you’ve saved up over a quarter million dollars in your 401k to necessitate completing the form, the 5500-EZ will not really seem that big of a bother to complete.